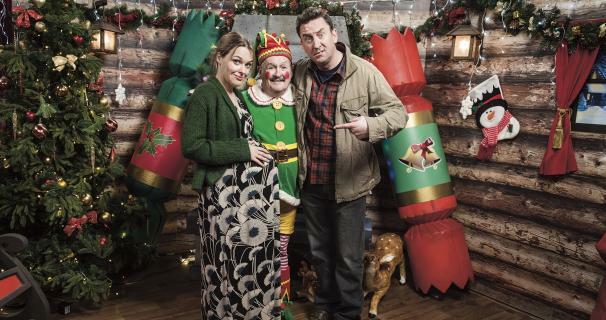 Lee Mack and the team from Not Going Out filmed this year’s festive special on location rather than in front of a studio audience. The Christmas Shopping episode airs on Christmas Eve, BBC One at 10.45pm. Lee and Lucy do some last-minute Christmas shopping in Wimbledon in Merton – before inevitably things go terribly wrong… Key scenes were filmed on the lower level of St George’s carpark, where a car backs into a van. This episode re-visits the couple a year after they’ve tied the knot. Lucy (Sally Bretton) is three days overdue with their first baby. The couple find themselves mistakenly caught up in a robbery at the local department store. Alongside them are Lee’s dad Frank (Bobby Ball) dressed as Santa’s elf, their friend Daisy (Katy Wix) along with neighbours Toby (Hugh Dennis) and Anna (Abigail Cruttenden). Locked in and faced with a dangerous armed robber wearing a Father Christmas latex mask, with gun shots, plenty of screaming and hiding in Santa’s grotto – will Lee’s actions and usually ill-thought out ideas get them into even more trouble? FilmFixer director Karen Everett says St George’s carpark is an unlikely but brilliant London location, adding, “Finding an entire unused level of a London carpark is one of those hidden gems that productions are always happy to learn about. It was really useful to allow filming in the carpark right by the shopping centre where the rest of the episode was shot.